What does a piece of writing need to do in order to be called a poem? This is the question I asked my seniors at the beginning of class this week. We had just finished up a poetry unit on lyric poetry and to finish off I wanted them to think critically about what a poem is with a fun, yet engaging activity. I wanted them to think about: how would you define a poem? What qualities must it have to be considered a poem? We spent the first five minutes brainstorming about those two questions. The responses varied. Some said that a poem needed to have some sort of purposeful structure and convey an emotion. Some said that “it had to mean something.” Other were willing to accept that anything could be considered a poem. I welcomed all responses, because the next part of the class was going to challenge their notions of what a poem could be. We strolled down to the media center to look at eight pieces of writing that have been called poems at some point, but pushed the boundaries of what a poem could be. They had to answer two questions for each poem: Is it a poem? and Why or why not? We then went back to the classroom to discuss what they thought. Their problem with it was they didn’t know how to read it, and if they did figure out how to read it, the payoff wasn’t all that great. Still, some thought it was really interesting. A Blackout Poem I Found on Pinterest (these are really easy to find. Just search for “blackout poem” and you’ll find a bunch). We had interesting conversations about this one. 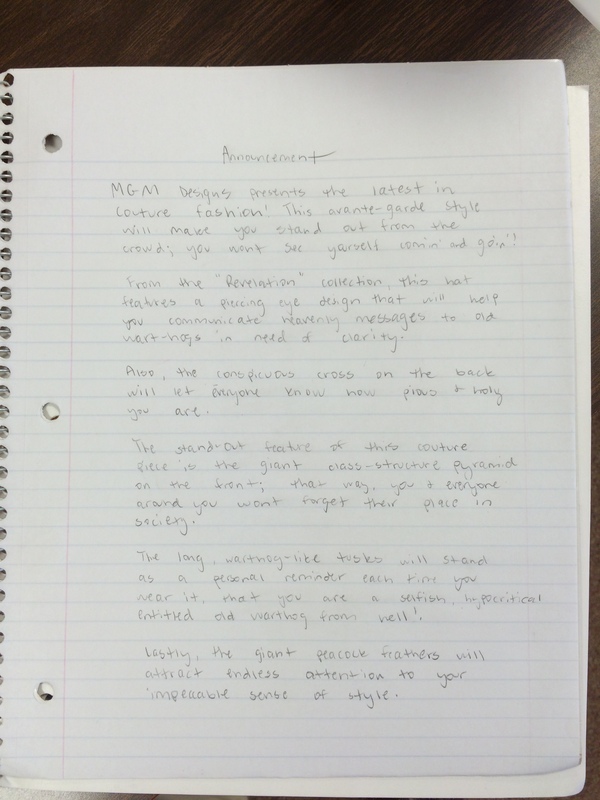 Some students thought blackout poems were a form a theft. As we discussed these poems a few larger questions came up: Can we call a piece of writing anything that we want it to? Is that up to the author or the reader to determine? and just because we call it a poem, does that automatically make it a poem? Who gets to decide? Students looking at a blackout poem. Do you have any other poems that would work well for this activity? Let me know! I’d love to expand this lesson. Students love to write suspenseful stories, especially around Halloween. 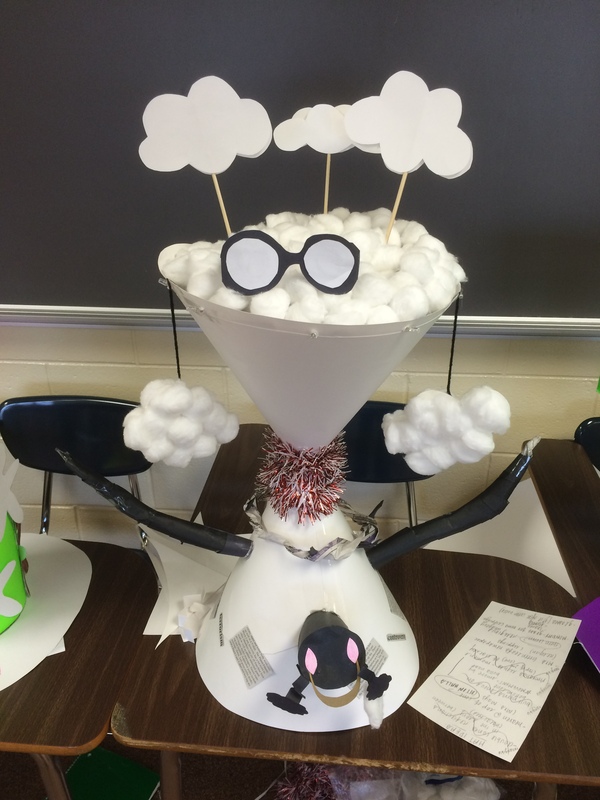 They can be a fun diversion in a secondary Language Arts classroom which can sometimes be dominated by essays. But if done properly, they can also teach students a great deal about how stories are constructed using suspense and imagery to create a particular mood. In this post I will address how I teach students about the technique of creating suspense and some of the texts I’ve used to model it. 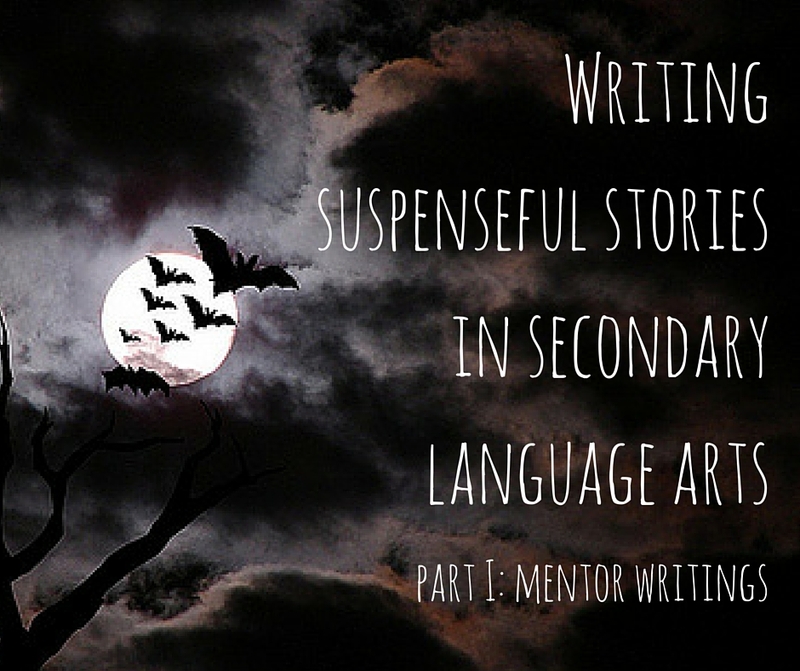 In the second post I will explain how I use writing suspense to teach literary devices. In the third post I will cover how we write the story. First off, I allow students to write a suspenseful non-fiction story about something that happened to them, or I let them write a fiction piece. However, I tell them they cannot write a horror story. There should be no blood or violence, even implied. Too often students fall into basic horror story tropes that they don’t do particularly well. Also, as you’ll find out in a later post, they aren’t writing a story that is a piece of flash fiction (or three-minute fiction) rather than a full length story. You can certainly do that; however, I find that students need some boundaries or they’ll write too much. This isn’t necessarily a bad thing, but many students tend to lose control of their writing that way. You can do a search for “how to create suspense in writing” and find a lot of good handouts. But the idea is pretty simple: you make your reader wait for something they want to know. There are a couple of ways to do this. Slow the story down. Many young writers get to an exciting point in a story and speed up the action. The trick is to slow it down by adding details. One way you can do this is to get inside the character’s head and describe what they are feeling. You can also describe in great detail the setting, the slow walk to open the door, and various other things. Put in a hard decision. Give the character a tough decision to make and have them weigh in their mind what to do. Too many students give the character a choice but then solve it too quickly. Make them weigh the pros and cons by getting inside the character’s head. Better yet, give them two undesirable outcomes and have them choose from those. I have a couple of model texts that I use with students that get them thinking about suspense. I try to use several different genres as well to help them understand how suspense can be used in a variety of settings. The links to the stories are at the end of the post. This is a frequently anthologized poem with an air of mystery about it. Suspense is created because the traveler knocks on the door a couple of times and receives no answers, and there’s some ghostly listeners as well. Why is he there? What’s the deal with the cryptic message he delivers? I love using this story to teach suspense. 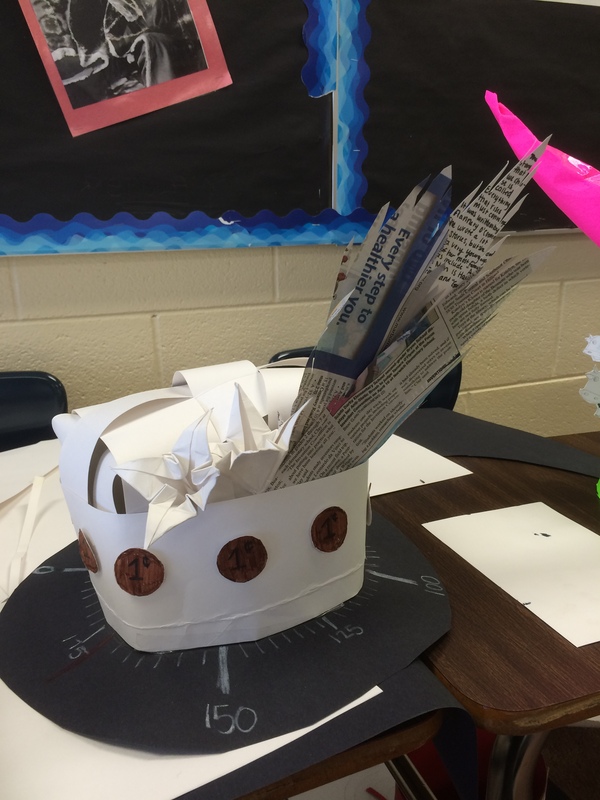 For one thing, it’s the type of story that students would like to be able to write. A woman is home alone during a storm and believes that someone is looking in the house. She goes to the basement and finds a dead body. I have the students read and annotate looking for examples of the ways to create suspense described above. The part where the woman goes down into the basement and discovers the body is a textbook case of how to create suspense. I usually ask my students what would happen if we simply read that she went downstairs, opened the trunk, and found the body. There’s an awful lot of great imagery in the story as well. This story is a part of the novel Dandelion Wine and describes an older woman taking a shortcut across a ravine to get home, all with the threat of The Lonely One lurking in the background. This is another example of a story that kids would like to be able to write and works particularly well with middle school students. I tend to use “The Storm” over this one because to be honest, it’s a little corny and a little too long. But it would still work well. The chapter that makes up the story is on page 124 in the link. There’s also a pretty cool radio adaptation of the story here. This is a nonfiction piece about a boy who is dared to jump in between the wheels of a moving train, stay there for a minute, and roll out the other side. It’s a great example of how you can create suspense as we find out whether or not the narrator will succeed. This is a quick newspaper article. These selections are the ones that I use in class as models for suspense. 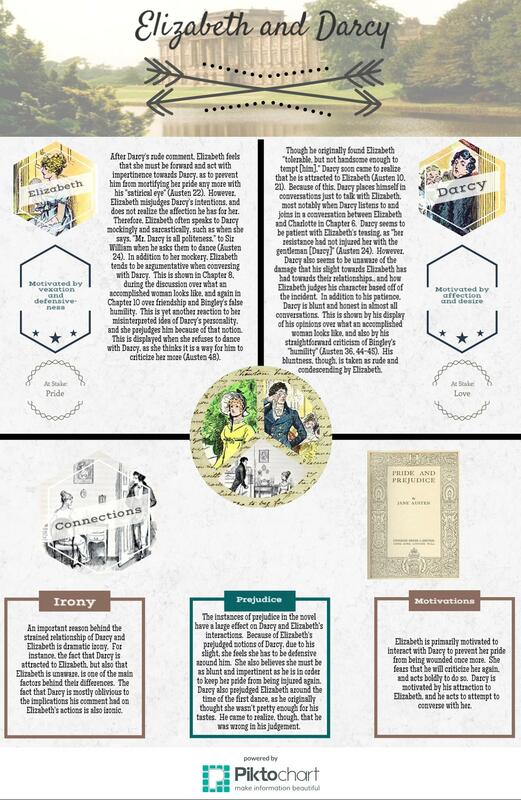 In the next post I talk about how to use these works to teach literary devices. I like finding new ways for students to display their understanding. I was inspired by the idea of having students create an infographic as a way to demonstrate their understanding of a topic. Pinterest is full of them because they are visually interesting but informative at the same time. Plus, they would force students to think outside the box in ways that an essay doesn’t really encourage. 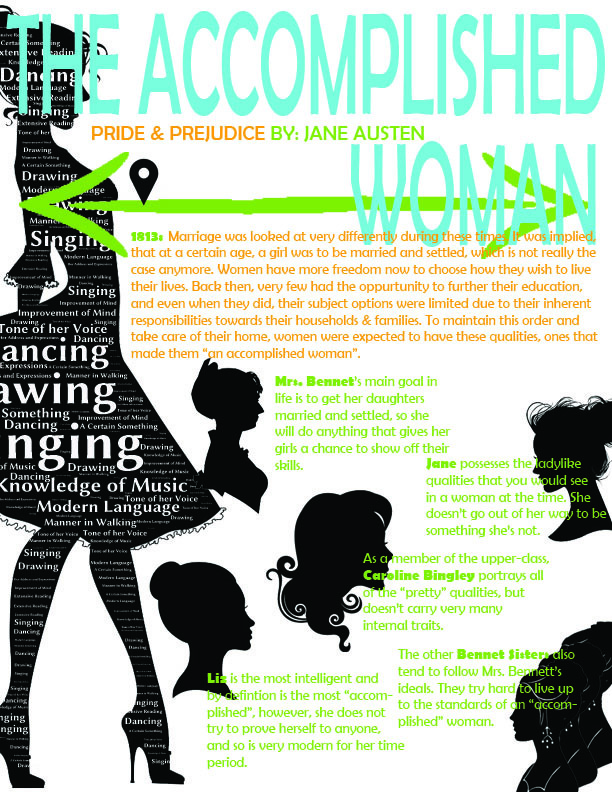 At this point the class had read the first ten chapters of Pride and Prejudice. 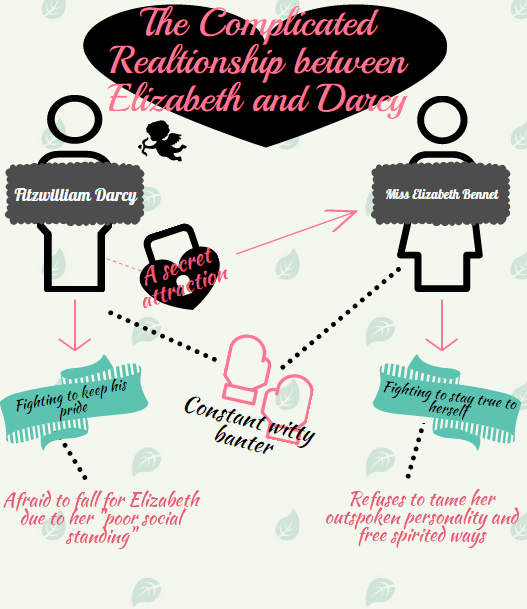 I gave them a few topics to re-explore in this section: the relationship between Elizabeth and Darcy, the importance of dance, what it means to be “an accomplished woman,” and Mrs. Bennet’s schemes to get her daughters married. They had to reread and annotate to draw some conclusions and I selected a few articles for them to read for background on the culture. They had to display their knowledge as an infographic. 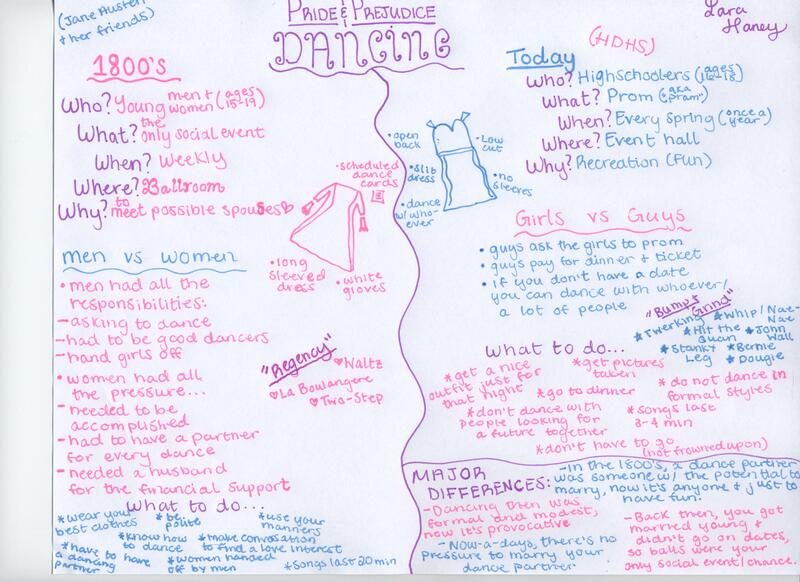 Below are some examples of student work. The first three were created using the templates on Piktochart. The fourth was done on Photoshop and the last was done by hand. I was really pleased how they came out. They were very easy to grade and forced the students to think about how to organize their information creatively and effectively. I teach seniors. At the end of the year it can be difficult to engage them in anything academically, especially writing papers, even in AP Lit. Therefore, I like projects that fool them into demonstrating their understanding of what we’ve read. 1. The hat must look cool. 3. 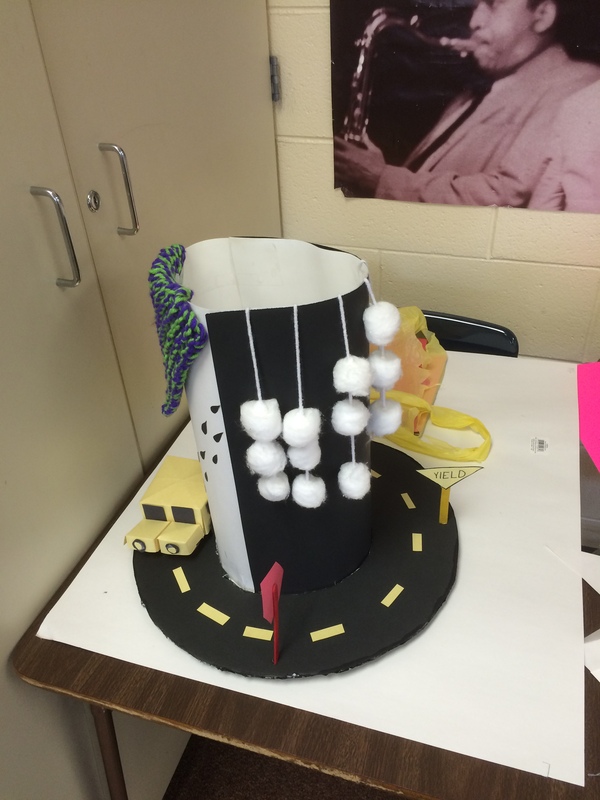 The hat had to include two tangible items from the story, two intangible items (themes, main ideas) and the moment of clarity that happens in each O’Connor story. 4. The hat had to have a moving part. It could be something that moved when you walked, or something on the hat you could manipulate. 5. The hat had to be wearable. The construction of the hats took about four days of class time – one day of planning and three days of putting it together. Since I teach AP Lit four classes out of the day, I was able to move the desks out of the way and use my room as a studio and move my freshman class to another room for four days. I would encourage others to do this project for other stories or novels. The kids were definitely engaged and had to use serious problem solving skills. The author of this article is David Rickert, who leads parallel lives as a cartoonist and teacher. When not creating comics out of thin air, David teaches high school English Language Arts in Columbus, Ohio. His witty and engaging cartoons turn abstract and complicated concepts into concrete and concise images to embed content into our long term memories. Let’s face it: he makes boring topics entertaining. Check out his Grammar Comics and more resources to bring life to your ELA instruction at his store.